If I had to name my best feature, I think it would have to be my skin. It is the thing I am most complimented on and I often get asked the question, "what do you use?!". While I wholeheartedly believe that everyone's skin is different and that there is no miracle combination of products that just always works, I've decided to list my favorite products in case they come of use to anyone else out there. These are items that I've put to the test and have never let me down. Fresh out of the shower...no filter, no makeup, just really nice lighting! I stumbled upon this stuff 2 years ago when, in a fit of "oh god I'm getting old! ", my best friend and I wandered into the mall in search of higher-end face cream. 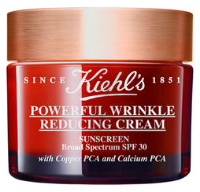 Even though the Kiehl's lady laughed off my claims of forehead wrinkles (I spend most of my day giving the computer disappointing looks) she pointed us towards this stuff and I haven't bought anything else since. The formula is nice and thick, but without being greasy and does a great job of moisturizing my forever dry skin. The SPF is obviously a must-have, since the best way to fight wrinkles is to prevent them from happening in the first place! While I don't have any "before" pictures to compare myself to, I definitely think this stuff has smoothed my forehead and contributes to my fairly even complexion. While initially put off by the price, I've found that one jar generally lasts me 5-6 months, so the value is there. This probably seems like a weird addition to a beauty post...but hear me out! Not only are these two oils great for healthy cooking, they also work wonders for hair and skin. I like to make a mixture of this stuff (3 parts olive oil to 5 parts coconut oil) to keep in a small jar in my bathroom for easy application. This mixture is the perfect non-irritating eye makeup remover. I simply dip a cotton swab in it then apply to my eyelashes for easy removal of mascara and eyeliner. In the winter months I'll apply a small dab of it to my face and neck before I moisturize, to help combat the awful dry winter air. I also use these ingredients to make my own shaving cream, moisture spray, and body scrub...but I will probably write a separate post on those! Although you can find these products in almost any grocery store, I prefer to buy the "big guys" from Costco to save a few bucks. I first read about this thing on xoVain a month or two ago and the glowing reviews convinced me to try it out for myself. I've been using it 2-3 times a week for the last 6 weeks (I don't wash my face every day...yes, I'm gross) and I'm pretty pleased with this strange little sponge! I hang it in my shower where I can rub my face down while I wait for conditioner to work it's magic. It seems to get my face really clean and, I may just be crazy here, but I swear it is evening out my skin tone as well. Although I don't have acne, I've read other reviews that say it helps clear that up too! Baking Soda - Price depends on size of box, but really it is dirt cheap. Plain old baking soda is by far the best facial exfoliant I've ever tried. It leaves my sensitive skin feeling smooth and clean without the raw feeling that harsher exfoliants often leave. I mix a tablespoon of it with a little cleanser or just plain water and rub it in circles all over my face and neck. If you try this out, make sure to moisturize after as it is a little bit drying. Neutrogena Cleansing Towlettes - Price varies based on size. As previously mentioned, I don't wash my face every day...partly because of laziness and partly because I've found in the past that daily washings turn me into a bit of a lizard woman. Because of this, these cleansing wipes have become a must-have in my home. They're great for a quick wipe-down and clear up any mascara bits that stick under my eyes. As with many other things I buy, I get them from Costco where you can get a giant box on the cheap. Last but not least, the product that works the most wonders for my face has got to be water. Drinking many ounces of water out of my favorite water bottle every day makes the biggest difference in my skin. Dehydrated days lead to me looking like a reanimated corpse so I try my hardest to drink at least 3 of these 24oz water bottles a day. Natural curls and a natural face.